Since Elyse and I arrived in Golden earlier this year, we’ve had the opportunity to meet hundreds of alumni from the Class of 1935 to the Class of 2015 and just about every year in between. Whether it was on campus during Alumni Weekend or at a Mines on the Move event, we’ve loved hearing about your experiences at Mines, your impressions of Mines today, and your aspirations for this great university. I’ve also spent quite a bit of time with the Class of 2019, carrying my 10-pound rock from Arizona up Mt. Zion for my first M Climb, teaching CSM 101 (I learned as much as I taught), and hosting dozens of pizza lunches for students and faculty. They say first impressions are the strongest, and my first impression of Mines was that of a very special community, extending from campus to around the globe and made up of exceptional and engaged individuals having great impact in industry and society in general. Now, with a few months under my belt, I’m even more convinced of the truth of that first impression. I have learned what makes Mines special to you. 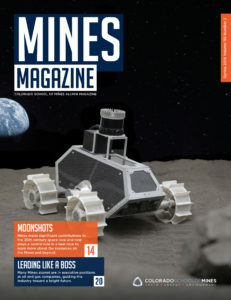 It’s the value of hard work and the bond that creates our pride in hard-won accomplishment, the resilience of Mines’ students, Mines’ robust connection to industry, and traditions that are unique to Mines. Those will always remain core values of Mines, while we evolve as we must, to remain relevant to the needs of society and to continue to attract those amazing students who best fit the Mines education. The evolution of Mines is especially evident as I walk around campus. Today, it is a beautiful synergistic blend of old and new, and it reflects our aspirations for the future of our academic programs, the student experience, and our passionate alumni. As we look to the future, we want to increase the visibility of our alumni, foster meaningful engagement through programs, tap into your ability to inspire our students and provide new opportunities for them, and grow Mines’ reputation. I look forward to working with you on this. If you have ideas and interest, please share them with me at [email protected] Go Orediggers!